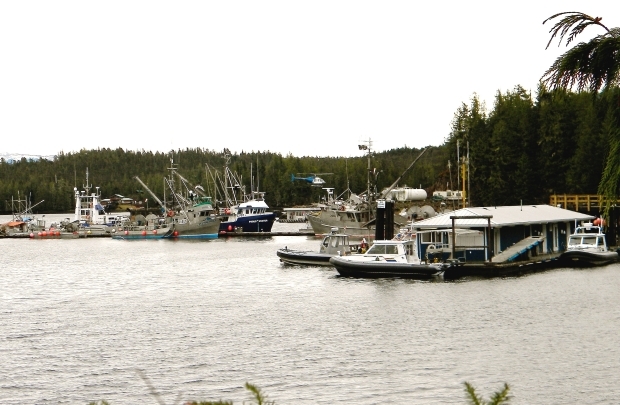 Several RCMP boats parked at docks in Bella Bella, ‘BC.’ as part of their operation against Heiltsuk, March 2014. The federal government has chosen a remote stretch of B.C. coastline to square off against aboriginals in a fight over an imminent commercial roe-herring fishery. Federal fisheries minister Gail Shea is being blamed for an escalating conflict over a forthcoming commercial gillnet fishery that has resulted in RCMP descending on B.C.’s central coast to guard against potential interference by Heiltsuk natives. April 2,2012 Bella Bella – In a surprising development the National Energy Board Joint Review Panel has cancelled today’s hearings in a remote coastal community of Bella Bella after peaceful demonstrations greets panel members at the local airport.